We don't know how to grade coins. What you see in the pictures is what you get. Item sold "AS IS ". PHILIPPINES 1922 ONE PESO CULION LEPER COLONY COIN, STRAIGHT WINGS, COPPER-NICKEL, KM-16. Very nice coin. Moderate wear. This is the actual coin that you will get. We are more than happy to work things out with you. 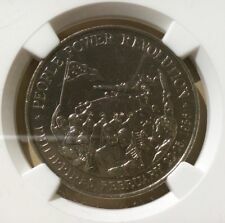 You are buying one Philippines 10 Piso 1988 NGC MS 66 People Power Revolution. Total Amount (USD). 30.01 - 750.00. You are looking at an almost uncirculated 1975 five Piso nickel coin from the Philippines. The obverse of the coin is of Ferdinand Marcos. This coin is bright and shinny, although the photos don't show it well.no obvious wear. The coin you see is the one you will receive. Please look at the photos for I sell coins as a hobby and I am not a professional grader so please grade for yourself. Please check out are other items we have Morgans, Peace dollars, half dollars, quarter's and world coins. Combined shipping can be made if you request a final invoice before paying. IT IS IN GOOD CONDITION AND HAS NICE TONING. THIS WOULD BE GREAT FOR ANY COLLECTION. 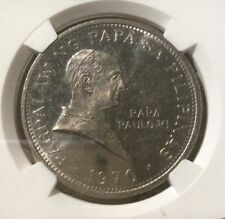 1975 Philippines 5 Piso KM# 210.1. Philippines 5 Piso KM# 210.1. This coin is uncertified – defined as a RAW coin. The coin in the photo is the coin you receive. Composition: Nickel. This is a YG coin – You grade it. We are more than happy to work things out with you. 1975 - 5 Piso World Coin. We do not enhance or alter the photos! 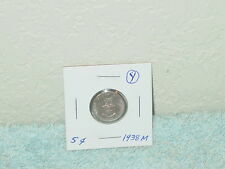 The photo may be a little lighter or darker than the actual coin. Coin shown in pics are the ones you will receive. I’m not a coin collector or dealer. I’m cleaning out my Father in laws hoard of coins. Philippines 1992 - 1 Piso Stainless Steel Coin - Jose Rizal - Tamaraw bull. Shipped with USPS First Class Package. One Piso Coin. 2010 Philippines. Central Bank of the Philippines. Look at our other coins. See photo for condition. 1 Piso Coin. 1996 Philippines. Central Bank of the Philippines - 1993. Coin of 1996, the 1993 date is the year of founding of the bank. Look at our other coins. See photo for condition. 1 Piso Coin. 1995 Philippines. Central Bank of the Philippines - 1993. Coin of 1995, the 1993 date is the year of founding of the bank. Look at our other coins. See photo for condition. Denomination : Piso. Face Value : Piso. Catalog Initials : KM. 23.17 gr(Coins>Foreign>Philippines>Philippines). Country : Philippines. Composition : Nickel. Year : 1970. First Issue Date : 1970. 2018 10 Pesos- 1 Centavo NEW GENERATION COINS Philippine Banko Sentral. Micro-printed details using laser-engraving technology were used for the P10 and P5 coins, which will make it harder for these coins to be counterfeited. 25 Sentimos. 1971 Philippines. 25 Cent Coin. Look at our other coins. See photo for condition. Nordic Gold (Gold Plated). BUY NOW! "General Malvar’s valor, resilience, and patriotism serve as inspiration to our fellow Filipinos," BSP said. Item is as described. BUY NOW! 10 Piso (People Power Revolution). Denomination:10 ₱. NOT TO BE MISSED. Check out our. favorites list. 5 PISO . FERDINAND E. MARCOS. President Ferdinand E. Marcos. President Marcos in left profile with date of his rise to power. September 21, 1972. The New Society. [#89013] Philippines, République, 25 Sentimos 1979, KM 227. Philippines, République, 25 Sentimos 1979, KM 227 (Coins>Foreign>Philippines). Face Value : 25 Sentimos. Year : 1979. CNIL : 1424660. RCS REIMS 413 893 686 00019 – NAF 4778C. [#89021] Philippines, République, 2 Piso 1984, KM 244. Philippines, République, 2 Piso 1984, KM 244 (Coins>Foreign>Philippines). Face Value : 2 Piso. Year : 1984. The pictured item is the one you will receive. [#89012] Philippines, République, 10 Sentimos 1981, KM 226. Philippines, République, 10 Sentimos 1981, KM 226 (Coins>Foreign>Philippines). Face Value : 10 Sentimos. Year : 1981. CNIL : 1424660. RCS REIMS 413 893 686 00019 – NAF 4778C. [#89019] Philippines, République, 50 Sentimos 1988, KM 242.1. Philippines, République, 50 Sentimos 1988, KM 242.1 (Coins>Foreign>Philippines). Face Value : 50 Sentimos. Year : 1988. The pictured item is the one you will receive. The coin has the following face value:10 Piso. 1 Piso Coin. Central Bank of the Philippines - 1993. 2000 Philippines. Coin of 2000, the 1993 date is the year of founding of the bank. Look at our other coins. See photo for condition.